Hello! I'm fairly new to DnD but I've been all in for about the last six months, since getting in to it. I'm 35, live in a rural community and my wife doesn't play. Needless to say, my biweekly game is not filling this newfound void in my life. However, my wife would never stand for me dedicating another weekly 4 hour block on the computer to join a web based live game. Thankfully, I've found this site and I'm very excited to give it a shot! PbP is perfect for the person with the hectic schedule. A growing family is what brought me here. Trust me, if you have free time, we have a way to kill it for you! Do you have any experience with PbP? If not, try the new player solo game! You'll select your system and be assigned your own private GM Mentor to show you the ropes and run your first adventure with you. I can't recommend them to you highly enough! Ah yes, the age old problem of having large chunks of time available... PbP is perfect for that. You can squeeze us in, whenever. Be careful, you can still spend hours here, but it's all good, and I hope you enjoy yourself here! Nice to meet you man, I don't have much free time either, so PBP is the way to go! As Imveros says the NPSG is a great way to learn your way around the site. There's a link in my signature as well as a link to the other new member guides. Thirded on the new player game! Great way to settle in. My wife will occasionally sit down with me and the kids, but for sure this is the way I get my nightly itch scratched. Enjoy!! Thank you all! Looking forward to some PbP! I know that pain of not having the free time or folks to dedicate to a irl game session, but pbp really does help scratch that itch and depending on your group(s) you find any day can feel like game day. Its a really awesome feeling being able to watch a game go at a constant pace. Last edited by Retry; 03-18-2019 at 07:48 AM. Patron Deity: The Cat Lord. Flaw: Don't expect me to save those who can't save themselves. It is nature's way that the strong thrive and the weak perish. Appearance: Humanoid black panther with amber eyes, wearing dark green clothing (to include a hooded cloak) and dark brown studded leather armor. Personality: Smoke seems jovial on the outside, largely because it comes naturally for his people. On the inside, however, he is a storm of emotions. Motivation Smoke was born with a need to explore. The loss of his tribe has only added fuel to his mission to bring glory and recognition to his people. This seemed like an excellent opportunity to do just that. 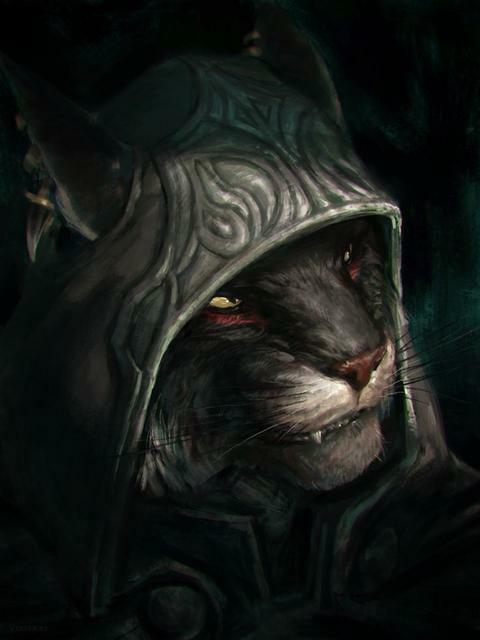 History: Smoke was born on a rather large Tropical Island, mostly inhabited by scattered tribes of Tabaxi. While out on a solo hunting trip, his tribe was wiped out by a goblinoid ambush. He stayed long enough to bury his dead, collect supplies, and barter the remainder of the resources for safe travel to the mainland, in search of adventure. Rain looks over his shoulder, just in time to see the Kobold's arrow sink into the human warror's chest. Somehow it has found an opening in the armor and the man collapses to the floor.. Mason!? Damn you all! As he turns back, Leloa (The Firbolg Druid) is already responding with some sort of magical blast directly into the creature. Rain, catching his senses, fires two arrows, from his longbow, in rapid succession. The first arrow misses it's mark but the second lands true in the Kobold's skull..ending the fight. Leloa, I'll check on Mason.. you just go check to make sure that no more of those bastards are waiting in the next hall! Leloa transforms into a rat and scurrys into the hall ahead. Rain rushes over to Mason's side and quickly removes the arrow. Not like this! He looks over his shoulder. Leloa isn't back yet.. He places a hand over Mason's mouth and slides the arrow back in, this time making sure that it pierces the warriors heart. I'm sorry old friend..but I can't risk you exposing me. Now no living soul will know my secret..